Posted by mispapelicos at 1:33 p. m.
you look elegant! love your shoes and bag. you are unique. that bag is just awesome!!! Me encantan los zapatos! vaya buen tiempo tienes y en Madrid lloviendo ;( ¡¡FELIZ PUENTE!! un beso. wow, this shade of purple looks so good on you my dear friend!!!!!! and I love the match with the stripes/yellow. The deep rich purple of the jacket is gorgeous! So classy!!! I love your bag it's such a perfect piece! Finally getting cvaught up!! LOVE this outfit--the vibrancy of the velvet jacket is stunning!! fab! very bright outfit! I love-love-love your bag! That jacket is rich and beautiful like you but I have to say you kitty bag is making me so jealous. I want it!!! Meow! Purple velvet.. Oh.. so gorgeus ! Have a nice evening Sacramento.! What a gorgeous blazer.I love love it!! I love your outfit. Your dress is so pretty and your bag is absolutely gorgeous. I have to take a look to looksoup!! 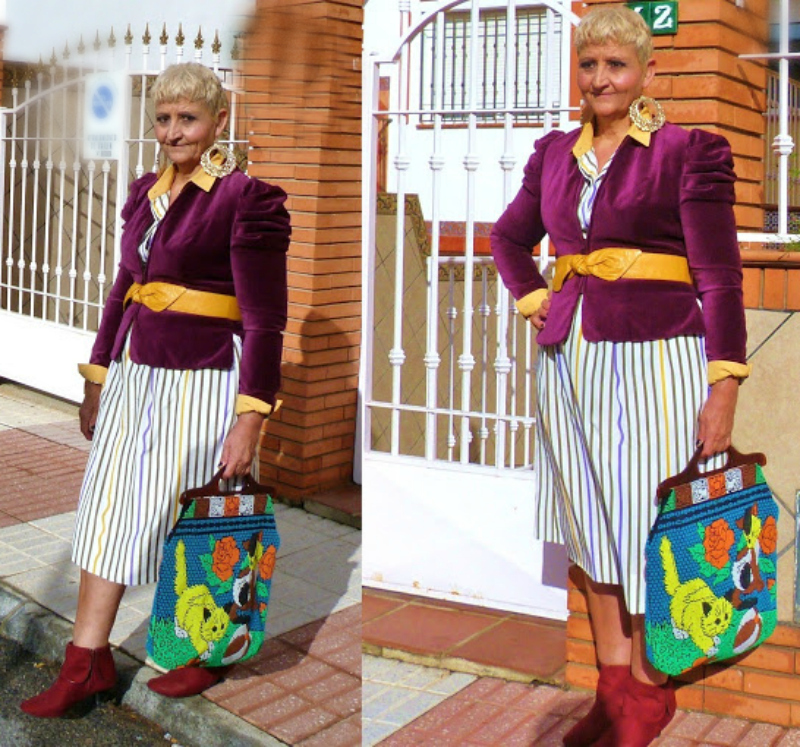 I adore your bag and this oufit, the colours are radiant!Everything is just perfect, and the purple velvet with yellow is brilliant!! I swear, you find the most fun accessories! Loving the bag. Also, your purple velvet blazer. u look great! never thought magenta & mustard yellow look so good together! loving your velvet blazer & boots! La chaqueta me ha gustado , el color sobre todo, tengo una similar en verde ingles,de terciopelo, pienso usarla bastante este invierno, besos ana. That purple looks amazing on you! and that bag.... incredible! Que guapa Sacramento. Los pendientes y el bolso me han enamorado. Estás explendida! Un beso guapa. Your bag is definitely the cat's meow and fit for royalty. As is your stunning velvet jacket. Viva the Queen of Fashion Statements! Absolutely gorgeous jacket. Love all the colors in your outfit. Me gusta tu combinación de colores! There are always so many wondeful details in your outfits. I could stare at them for hours! I really love that velvet jacket. It looks so much like the one my mom wore on her honeymoon, except hers is olive green. Is yours vintage? You are just so freaking FABULOUS!!! That velvet blazer is divine! Me encanta la combinación, y la americana soy super fan del velvet!!! That bag is so cute! Following you on GFC! It will be nice if you can check my blog and maybe follow me back! 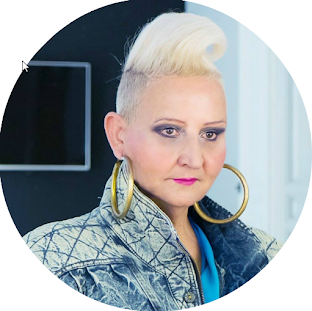 estas guapíssima Sacramento - me gusta muchissimo la color de tu look. estás moníssima e te quieda muy bien! Beautiful look - I love that jacket, amazing! Purple and yellow is a favorite color combo of mine! Thanks for the LookSoup tip. I'll check it out! me encanta esa combinación de colores y esa chaqueta púrpura!, es una maravilla hecha terciopelo!, y esa falda de rayas tan divina!, si es que estás estupendísima!!! Y le echaré un vistazo a este nuevo invento, me gusta investigar!! This velvet blazer is everything! Love the combo--you are as chic as ever! I will check out looksoup. Im not a pinterest user--just look, no pins. every little detail in this look screams Gorgeous!!!!! ...but the CAT bat!!! Wow! La combinación excelente. Quiero ese bolso que bello. I really like your jacket, it's a fabulous colour on you too, and amazing bag! Thanks for sharing Looksoup, I'll have to check it out since you have spoken so well about them! Gotta look up the LookSoup. Thanks for the direction. I like how you style your outfits..you always look fabulous you have wonderful pieces! Stripes and purple, it's a brillant idea. Purple, this color is very nice on you. It's a so pretty blazer. Hola Sacramento, qué guapa estás! Gracias por tus comentarios, ya estamos por el mundo blogger de nuevo! I love this look, being such a fan of stripes, I love the dress with the blazer combo, but it's the accents of mustard that make this outfit stand out. Looking beautiful as always and thanks for sharing info on Looksoup! Siempre he pensado que el amarillo y el lila o morado hacen muy buena pareja, en ti aun mas! Your stripes and colors are AMAMAMZZZZING!!! And that bag---omg---total perfection! Total awesomeness! You look phenominal and just love love love it! pero como me encanta tu look del dia! precioso el bolso, falda y zapatos! aaaw! this velvet blazer is so gorgeous. Oh I love velvet tops especially purple ones love this one you. La chaqueta es preciosa, y el bolso es una pasada. Eres la reina de los complementos originales, diferentes y únicos. Me encanta tu bolso! Madre mía que guay y la chaqueta de terciopelo burdeos es super bonita y te queda muy estilosa! Ya he entrado a looksoup, es una buena idea aunque, con tumblr,flickr,blogger,facebook,twitte, pinterest e instagram creo que me planto! LOVE that blazer! Very pretty!! I love Pinterest but ill have to check out look soup too. Sounds interesting! You look lovely as always - will have a look at look soup- sounds interesting. as alyways, you look very stunning! Elegant blazer and playful bag - what a lovely mix! I'm not a fan of Pinterest- I'm one of the few who doesn't feel the addiction- but I'd follow you anywhere you style maven you! Ese cinturón le da un toque perfecto a la americana. Debes de tener un montón de ellos ehh? The velvet jacket looks so wonderful with the striped skirt! Que genio de technologia eres - que ni puedo manejar el Pinterest suficiente bien y ya esta otra cosa a apuntarte? No me diga! Que cansansia! I love the whole look that blazer is such a great color but I think the bag is just awesome and really makes the outfit. Nice! Como me gusta el berenjena para invierno, nunca se me habia ocurrido combinarlo con el clabaza, pero queda genial. Gracias por LookSoup... me gusta. How did I miss this purple jacket post?!? I'm in love!!! such a beautiful velvet!